Two weekends straight, my family and I made a trek to Flushing — my family from Northern New Jersey and me from the East Village — for xiao long bao (soup dumplings) and more at Nan Xiang. My last post was all about Community Food & Juice not being worth an hour trip from the East Village. In this post, I present to you a restaurant worth the trip from the East Village, New Jersey, and beyond. 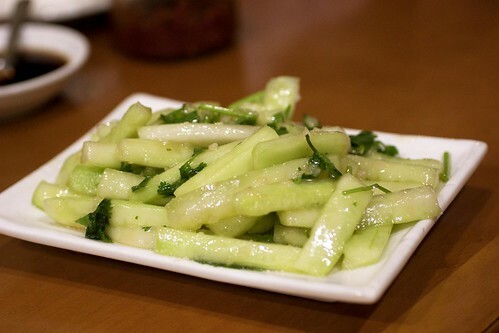 Cucumber & Garlic ($4.50) is a simple dish of cool cucumber sticks tossed in oil, cilantro, and chopped raw garlic which gives it a slight bite. We always order at least one plate. More often we order two. 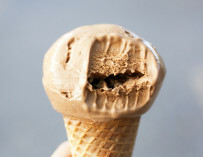 It’s nice to have something cold and fresh to eat, especially in between greasy and/or chili oil slathered mouthfuls. 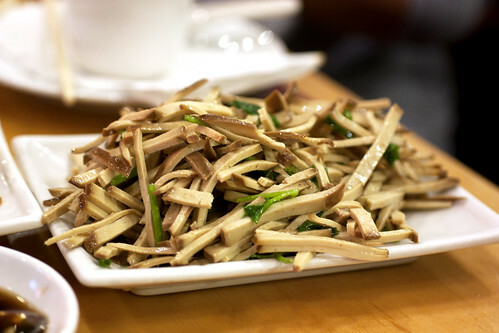 Even the offal-shy may appreciate the Spicy Beef & Tripe ($6.95), as long as they like chili oil. 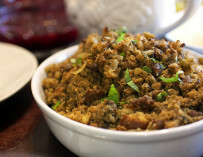 The tripe isn’t too gamy; just pleasantly chewy. 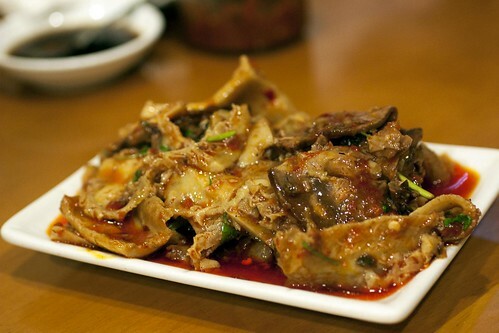 The lean slices of beef are good too, but I prefer the craggy surface of the tripe that soak up the spicy chili oil. 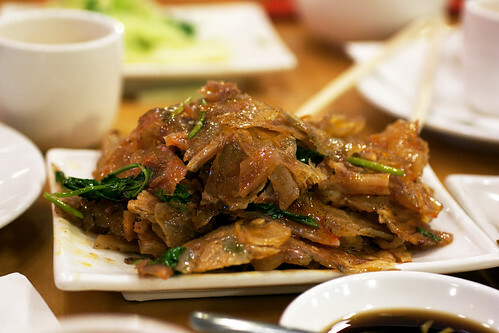 For those who prefer offal in less squishy form, Nan Xiang also has Spicy Beef Tendon ($6.95). The Spicy Beef & Tripe may be a little more spicy, but I like the slippery tendon also. In fact, in an ideal world, I would have a little of both. Bean Curd & Mixed Vegetables ($4.50) is pretty much chewy, shredded bean curd with cilantro tossed in sesame oil. 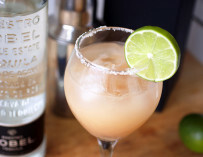 Again, it’s very simple, but quite tasty. 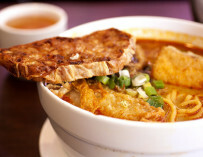 There’s lots of noodle dishes at Nan Xiang, and we tried a few. For my BF, who is a fan of plain noodles, I ordered the Noodle with Scallion Sauce ($3.75). 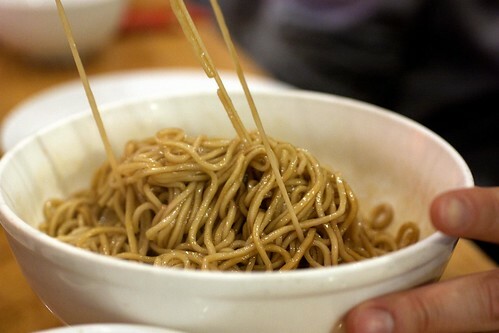 The noodles are slicked in a soy and scallion oil concoction. 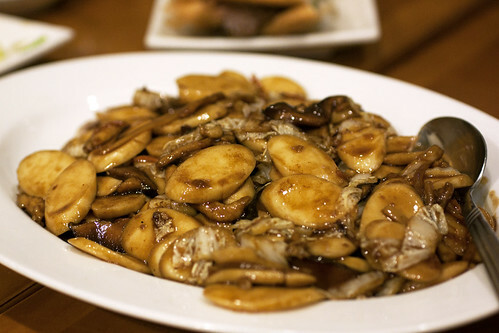 Charred pieces of scallion are strewn throughout which adds a nice smokiness. David liked it and so did the rest of us who stole a few bites. As David is coming to realize, whether he likes it or not, my family eats everything family-style. The Shanghai Pan Fried U-don ($6.95) isn’t made with Japanese udon, but with fat Shanghai wheat noodles which are comparable in shape, but more floury and less smooth. 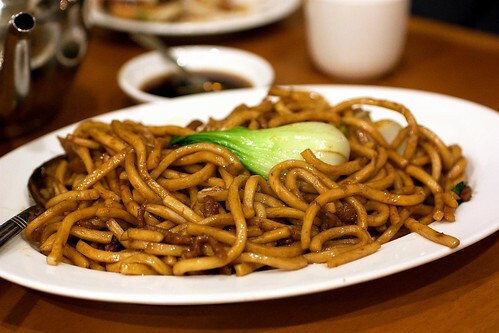 (Chinese restaurants often refer to these noodles as udon since it’s more familiar to non-Chinese people.) The Shanghai Pan Fried U-don are similar to the pan fried noodles a few blocks away at Joe’s Shanghai, but a little less oily, less fried, and also with less pork. Considering the price though, the amount of meat was to be expected. For the longest time, I was never into stir-fried rice cakes (why stir-fry when you can have spicy, saucy ddukboki? ), but I’m coming around. For example, I like Nan Xiang’s Rice Cake with Beef ($6.95), stir-fried sliced rice cake with beef and cabbage in a soy based sauce. The rice cake is never too mushy and have a good amount of sauce and oil to prevent major stickage. Again, more meat would be nice, but for the price, you can’t complain. 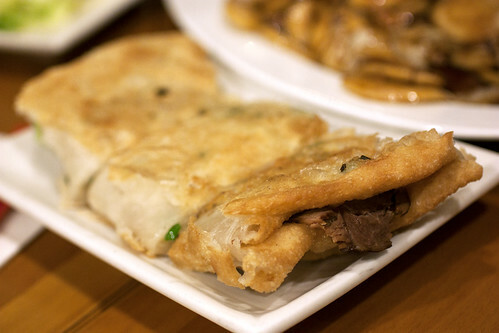 Scallion Pancake with Sliced Beef ($3.95) is probably my brother’s favorite dish at Nan Xiang. After one dish arrives, his response is usually, “We need another one of these.” And it’s true, we always do. It’s a fried scallion pancake wrapped around sliced beef, sweet hoisin sauce, and shredded scallions. 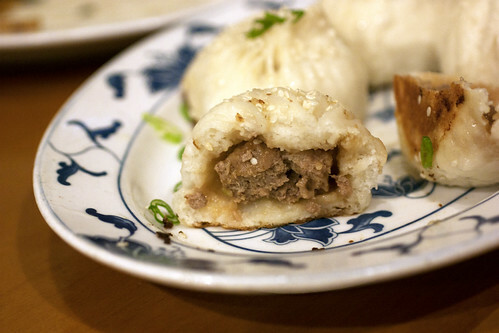 It’s like the fat cousin of the Peking duck bun; filled with beef instead of duck, and sandwiched with a scallion pancake instead of a steamed bun. Completely scrumptious. My only wish is that it were fried better. The inside tends to be a little doughy. Pork & Vegetable Wonton in Casserole ($5.50) is probably the only dish I wouldn’t order again. Not that it was bad, but it just didn’t blow me away. 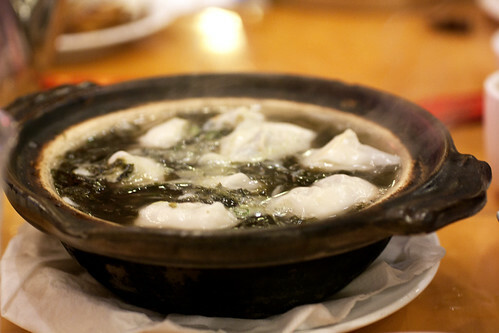 It’s pork and chive wontons in a seaweed soup flavored with tiny, salt-fermented shrimp (새우젓, saewoojut). Don’t get me wrong, the wontons are plenty good with lots of meat, but again, it’s just wontons in seaweed soup. 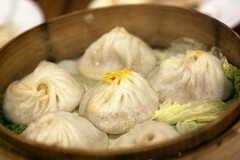 I’ve written about the xiao long bao at Nan Xiang before, and at the restaurant, they are every bit as good. More like excellent. 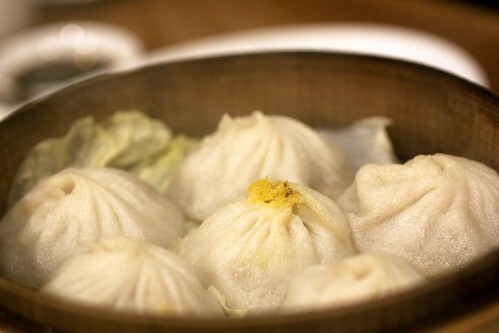 Listed as Steamed Crab Meat and Pork Buns ($6.50) on the menu, these soup dumplings are seriously well-crafted: thin skinned with lots of soup. Sorry, I don’t have a picture of the soup, but I have my priorities. I drank, and then shot. I’m not one to waste precious soup for a photo. 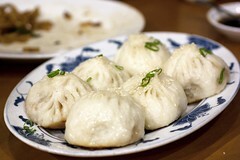 My favorite at Nan Xiang, besides the xiao long bao, are the Pan Fried Pork Buns ($5.50). 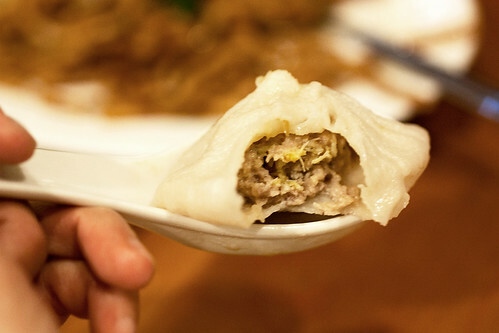 filled with juicy orbs of ground pork. The only problem? These buns take the longest to make, so order them as soon as you sit down. You will be rewarded well for your patience. Another family trip to Flushing is currently in the works. Not sure when it’ll happen, but if not soon, I’ll have to go back to Nan Xiang myself. It’s worth it. o god, I love this restaurant. Best XLB in the greater NYC area. Gorgeous photos! @Chris – Damn, you’re quick! Yup, I completely agree, and thanks. Now go to sleep! My wife and I love this place, too. Have you had the crispy turnip puffs there? I LOVE those things. This place really is a notch or two above all other competitors. 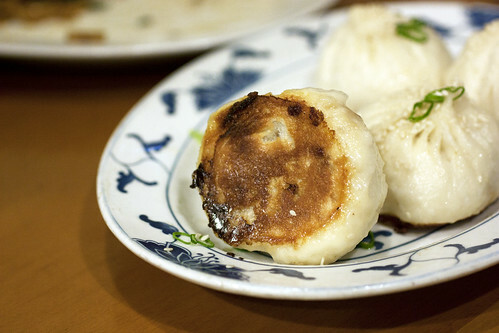 Those pan-fried dumplings = highway robbery. 6 for $5.50 is like… almost $1 per. In Taiwan they are 16 cents. MUST GO TO TAIWAN TO EAT YES? @Adam – No, I haven’t. Now even more reason to go back! @Nicholas – Still cheaper than a plane ticket, but yes, take me to Taiwan. I’m ready when you are. Seconding the turnip puffs 🙂 Nan Xiang is the business! Thanks, they are great! I went there after reading your previous write-up. @James – MUST EAT TURNIP PUFFS! @someguy – I remember you mentioned you were going last time. Glad you liked it! Love the place. oh man i need to go back. i’ve only been twice and it doesn’t feel like enough!